Our Gulf of Mexico Key West fishing charters make sure that have a trip of a lifetime while on vacation. We offer some of the most exciting fishing opportunities in this area. This tour takes us to the Gulf Coast Towers, home to an amazing fish population. These towers are Air Force communication towers in the deep water 9 miles off the coast. 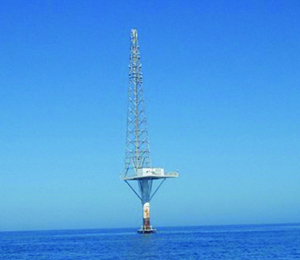 The towers are therefore located in Federal waters, which are only open to fishermen who carry the appropriate permit. Our captains have the appropriate permits which allow them to offer the best deep sea fishing Key West has. The acquisition of this special permit requires a lot of experience, which is why not many fishing charters in Key West can legally fish around the towers. We want to make sure that you don’t miss out on fishing in this amazing location, which is why we offer you this fantastic opportunity to go fishing with one of our permit-holding guides! The Gulf Coast Towers are a Key West fishing location not to be missed. The sheltered area around their gigantic legs have become home to a wide variety of fish. Some of the fish species found around the towers are permit, snapper, grouper, barracuda, cobia, and many others. Imagine yourself out on the deep waters under a beautiful Florida sun hunting down the most sought after fish Key West has to offer! Our captains have the experience and expertise to help you score the catch of a lifetime around the towers! This is a great fishing location for all seasons and with a guide who has enough experience to have received his permit, this fishing excursion can only be a success. We have the right boat and the perfect captain to make your fishing adventure around the Gulf Coast Towers exciting, rewarding, and memorable. We are experts when it comes to Key West fishing and our captains are among the few who hold the permit allowing them to fish around the Gulf Coast towers. If you only have time for one trip while on vacation, this may be just the one to go on. Not only is it a productive fishing experience, but it is also an extremely unique one that many will never have the opportunity to experience. Let us take you there! I have been to the Bahamas many times, but Gulf Of Mexico Towers is one of my favorite trips! It includes everything that everyone should do here. As a Bahamas veteran, I can say only the best about this experience!